Miscarriage can be a really traumatic event. It takes away all the hopes and dreams that a positive pregnancy test brings. The experience can leave you with overwhelming feelings of loss and grief. Sadly, it affects many women and even if it happens very early in pregnancy, it is only natural that it comes as a shock. Losing a baby can be tragic no matter how early in pregnancy it happens, and the best way to deal with such a terrible blow is to allow yourself to grieve and allow yourself a chance to recover. Family and friends offer their support in any way they can but frequently forget that a woman who just lost her unborn child feels angry, sad, hurt, desperate. She wants to vent, she wants to be heard and not get unsolicited advice and commiserations (there are always exceptions of course). The truth is when someone is grieving the loss of an unborn child, it is very difficult to know what to say and in attempting to say words of comfort people often inadvertently say the wrong thing. Even though most people mean well, they are completely clueless when it comes to miscarriages and hence it is relatively easy for something idiotic (excuse my language) to pop out of their mouth and since words can sting, here are 9 things no one should say to a woman who just had a miscarriage. When the pregnancy results in a loss, this phrase does not provide comfort. Yes, the woman obviously knows she can get pregnant, she might already have other children. A miscarriage however, also “tells” her that she can lose a pregnancy too. Tacking on the “at least” does not help. Many people fall back on this when they don’t know what else to say. But this is not helpful for a woman who has suffered a miscarriage. Often, a woman spends a lot of time thinking of that elusive “reason” that led to the miscarriage and even though 50% to 70% of first-trimester miscarriages are caused by chromosomal abnormalities in the fertilized egg and are random, pointing that out isn’t helpful. There’s no “best” in such a situation. Does it actually matter how early or late a pregnancy was lost? Once a woman gets a positive pregnancy test she starts planning, dreaming, and loving that little being growing inside her and the emotional side effects after a miscarriage are very strong. 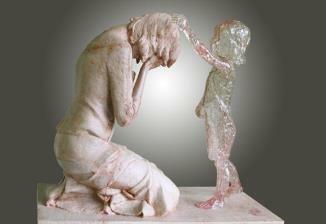 A miscarriage means a lost child, no matter when it occurs. Period. A woman just lost a baby and the last thing she wants to think about is rushing into another pregnancy. It is important to understand that she needs time to mourn and heal inside. A new baby does not mean that she did not suffer a tremendous loss. No one should judge a woman that is pregnant (or trying to get pregnant) no matter her age, let alone when she just suffered a miscarriage. You might not know why she had to wait before she had a child. Even if you do not agree with her life choices you should always try to connect with her loss and show your support. Yes, she probably can and will go on to have another child but for many women, getting pregnant just isn’t that simple. Many suffer years of fertility treatments, others are given very low chances of conceiving again. Whether she will have another or not, the fact remains that she has lost a child that she was nurturing inside her, and looking forward to holding in her arms. Any other children that she has later will be individuals in their own right, as is the one she thought she would have. People often blame something in the woman’s lifestyle, as if the miscarriage is some kind of judgement. The woman already is blaming herself for the loss of her baby. Having someone else accuse her of things she did not “do right” can have a terrible toll on her mental well being. It’s not about numbers. The child is an individual and the woman was dreaming of holding in her arms this child too! Of course, she may have other children whom she loves dearly but that does not mean that having a miscarriage will be less painful! Avoiding the subject or not acknowledging that a miscarriage happened can be as painful. Not talking about it does not imply that it did not happen. A simple, “I’m sorry” goes a long way. The truth is that it is not easy to find the right words. Women handle miscarriages in a variety of ways. The best way to help them is to just give them a hug and then listen if she wants to talk. She is devastated, she just lost her child and it does not matter to her that it was not born yet. If, after that, you still feel the need to speak up, be empathetic and loving, and remember what not to say. If all words fail, remember a hug and “I’m sorry” go a long way. It’s 6 years tomorrow since I lost my precious baby. We tried for years. Both my husband and I had older kids (3 between us both). That pregnancy would have been our first together. It’s been 6 years and I still can’t forgive him for that. I am really sorry for the loss of your precious baby. What your husband said wasn’t very nice at all – it’s a very difficult situation that, unfortunately, not many can understand, Thank you for sharing this.